Nicknamed "King of Swing," his songs include "Sing, Sing, Sing" and "Stomping at the Savoy"
His passion was music and his big band sound quickened the pulse of a generation ready to shrug off the Depression and dance. 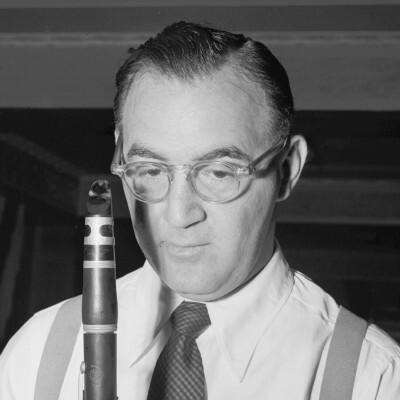 With clarinet in hand, Benny Goodman was transformed from a child in Chicago’s impoverished Jewish ghetto into the king of swing, greeted with near pandemonium wherever his band played. Goodman led jazz into the commercial mainstream and brought with him an extraordinary group of gifted and original musicians. Band members Teddy Wilson and Lionel Hampton were some of the first to break the big band color barrier. Held together by the force of Goodman’s personality and a willingness to put their music above all else, the Benny Goodman Band created a kingdom of swing with enthusiastic fans from coast to coast. It could have been a far different life, had destiny not intervened. Struggling to raise a family of eleven on sweatshop wages, Benny Goodman’s father believed music might be a ticket out of poverty for his eldest sons. He enrolled them in free music classes at a local synagogue when Benny was just ten. His older brothers were given a tuba and a trombone, but Benny, the smallest, got a clarinet. From the outset, he was a prodigy of unmistakable talent. As a youth, he had frequented the jazz halls on the south side of Chicago, soaking in some of the greatest musicianship in the world. By the time he was fifteen, Goodman had dropped out of school and already established himself as a professional musician. It was then that the Ben Pollack Orchestra asked him to move to California and join the band. Goodman spent the late 1920s and early 1930s traveling the country playing in bands led by Red Nichols, Ben Selvin, and many others. In 1934, he got his first big break. Putting together his own band for a local venue that was prematurely shut down, Goodman found a spot headlining on a new NBC radio program called LET’S DANCE. Broadcast live from New York from 10:30 in the evening to 4:30 in the morning, the west coast was just tuning in as Goodman’s band let loose in the wee hours. These regular performances created a nationwide audience for his big band sound, and it was this audience that would eventually go wild for the Benny Goodman Band in live performances at the Palomar Ballroom in Los Angeles, the Congress Hotel in Chicago, and the Paramount Theater in New York. His musical achievement reached its pinnacle in 1938, when his band blew the lid off of Carnegie Hall (the live recording of which was to become one of the best-selling jazz albums of all time). By the 1940s, the sound of swing, which had been an all-pervasive part of American culture, began to fade as many musicians began experimenting with new jazz forms. With the rise in popularity of beebop, came the virtual eclipse of big band and swing. 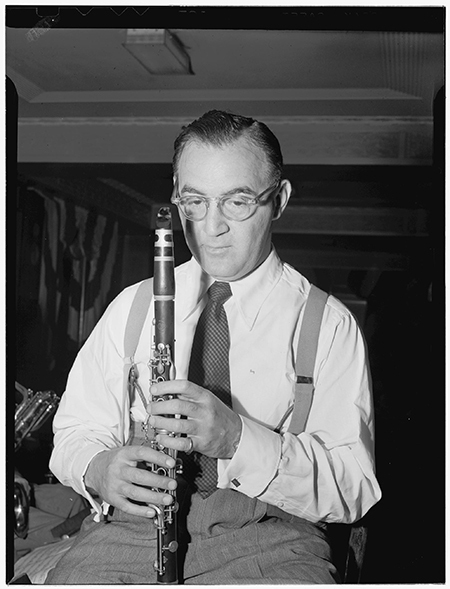 Though no longer in as great demand, Benny Goodman continued to play the clarinet, forming and fronting big bands. As an exceptionally dedicated musician and bandleader, Goodman was a major force in the popularity of swing, making a home for dozens of great musicians, including Fletcher Henderson, Gene Krupa, Lionel Hampton, Mel Powell, Peggy Lee, Wardell Grey, and Stan Getz. In his later years, he turned to classical music, and in June of 1986 he died while playing the clarinet (a Brahms sonata) in his New York home. To this day, Goodman’s music continues to find its audience among the young and old alike.